Why is being on your feet so important for your health. Are you reading this on your phone right now? If you are you’ve probably seen that your phone has the ability to track quite a lot. If you’re on an iPhone you have access to the Health app, which is a great way to track things like your steps each day. You might be a big fan of the Fitbit or other wearable technology to get a good idea of where you are at each day with your fitness. Over the coming years, I think you’ll see even more growth in the wearable technology department. We’ve already got things like watches and shoes that can track information and this will continue to grow. I’m still holding out for socks that can tell me the precise moment to throw them out. A big focus on tracking has to do with how many steps a day you’ve taken. This has caught on pretty well with a lot of people but you may have wondered exactly how many steps a day you should take and why this is so important? In this day in age, you really don’t have to be physically fit to get by. We’re living in cities where you barely have to walk if you don’t want to. We have drive through everything. We have machines that do our heavy lifting and elevators and escalators taking us floor to floor. Our ancestors who had to spend days hunting and tracking animals with the chance to end up with nothing would be rolling in their graves knowing we can drive up to a window and order a burger the size of your head. We’ve spent a lot of time off our feet and this hasn’t been the healthiest thing in the world. Why Is Staying On Your Feet Important? Winston Churchill once said, “Never stand up when you can sit down.” Judging by his physique that might not have been the best advice in the world. A lot of research has been shared about the damaging effects of sitting as it pertains to your health and waistline. You might think the idea that sitting can make you sick is weird but when you realize adults are sedentary for 60 per cent of the day and the average person sits six hours a day you can see how inactive we really are. Sitting for an excessive amount of time decreases bone mineral density, and on top of that excess weight from lack of activity and you have a lot more force on now weakening bones. As far as the weight issue, it’s hard to burn calories when you’re not moving. Excessive sitting decreases an enzyme called lipoprotein lipase or LPL. LPL can help burn fat and extended sitting essentially turns it off. How Many Steps A Day Do You Need? You’ve probably heard that you should aim for 10,000 steps a day. This is a pretty good goal but why was 10.000 the go-to number? The thinking behind it was it takes roughly 10,000 steps to burn 500 calories. Over the course of one week, you would have burned 3500 calories taking 10,000 steps a day. How many calories are in a pound of fat? Three thousand five hundred. The idea then is 10,000 steps can help achieve slow gradual weight loss. Calorie counting, however, is an imperfect science and there are many factors, specifically your diet, that need to be in check to ensure proper weight loss. Despite this, 10,000 steps is still a good goal to try for each day. For the average person, it can take around 100 minutes to take 10,000 steps. This gets broken up through the day but if you can keep an extended time period of around 30 minutes per day going you’re hitting that sweet spot of how much you should be exercising each day. How Many Steps Are We Taking Each Day? The average person is only taking around 1000–3000 steps a day. This is where that technology, either your phone or a Fitbit, lends a hand. You are able to see your progress each day and see how close you can get to that 10,000 steps. If you’re only getting 8–9000 that’s still great and some days you’ll do well over 10,000. With this rough goal of 10,000 steps a day you want to be shooting for spending at least 50 per cent of your waking hours on your feet. This is going to beneficial for optimal health. So what do you do if you’re well under this 10,000 mark? Let’s say you’re taking 5000 steps a day, jumping up to 10,000 is going to be a little overwhelming. Your goal now is to add in 500 steps a day which is around the amount I take chasing my dog when she steals my shoes. If you’ve been taking 5000 steps a day make it a point to get to 5500 each day to the end of the week. The week after you will aim for 6000 steps each day for that whole week. Keep this additional 500 steps until you’re up to 10,000 a day. How Can You Add-In More Steps? Well, you can borrow my dog to get started, but it’s actually not too hard to find places throughout the day where you can add in steps. You can start by going for a walk after dinner. 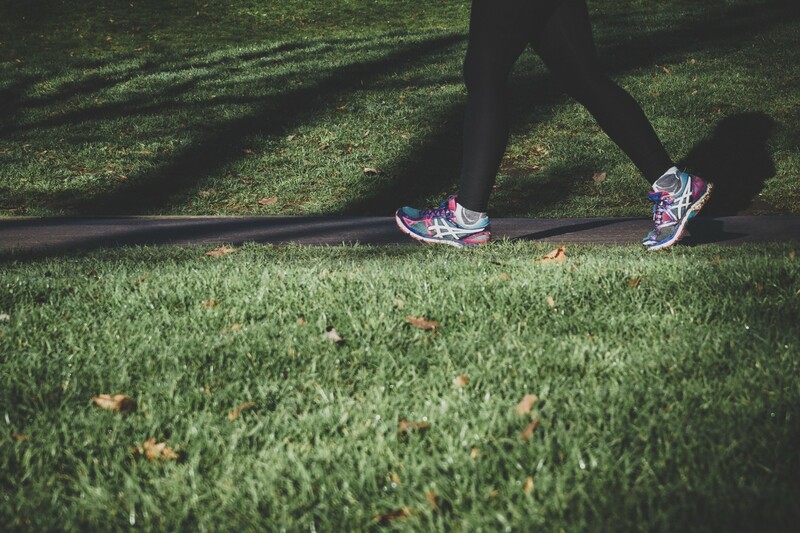 The average persons’ stride length is around 2.5 feet long so going for just a one-mile walk will use around 2000 steps. Definitely very doable. What are a few other ways you can increase steps? Remember that show Step By Step from the 80’s with Patrick Duffy and Suzanne Summers? It actually ran for seven seasons, even though it was pretty much a Brady Bunch ripoff. Anyway, I think you can see the issues that come from a lack of activity. Even if you do workout everyday we tend to neglect our basic human functioning and spend very little time walking. An hour workout is great but if you’re sitting for 10 plus hours the rest of the day you can still be running into some problems.